Have you ever been cruisin' down the I90 outside of Cleveland and sorta thought you heard a jet, but the noises got uncomfortably loud, to the point you fully expect to see a 747 landing gear in your rear-view, expect you don't...what you see is a red Porsche 928. And then it blasts by you in a fog of Jet B and testosterone...suddenly you want one yourself. 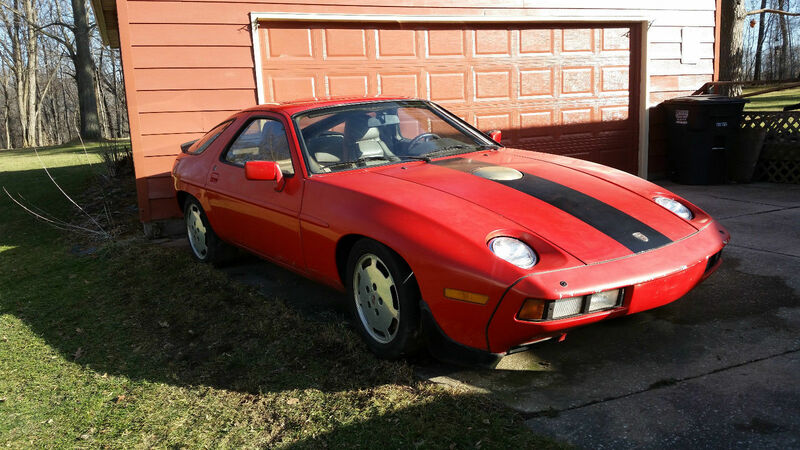 Find this 1984 Porsche 928S with Boeing 502 turboshaft power here on eBay bidding for $5,500 with a day to go, located in Painesville, OH. Tip from Hunter. The Porsche 928 was known as the German Camaro for its torquey V8 and muscle car attitude...but things change when remove the original V8 and replace it with a Boeing 502 (aka T-50) borrowed from a small Gyrodyne helicopter. The seller doesn't specify which version of 502 he used, but it could be rated anywhere from 150 horsepower to 350 horsepower depending on the original application and decade of manufacture since the 502 started life in the 1950s. I happen to know a few things about turbine engines -- first is that they produce very little torque -- but it happens at crazy high RPM (50,000 for instance) so those little torques get multiplied in a gear reduction box before you put it into the transmission (located above on the far left). Additionally, ff a turbocharged car has some turbo lag, then a turboshaft engine IS turbolag -- and it might not be a big deal until waze shoves you into an unprotected left on a 4 lane highway at rush hour. In an internal combustion piston engine, you mash the loud pedal, the throttle plates open up, more air gets sucked in, more fuel added -- presto, several combustion events later you are off and running. With a turboshaft, you mash on the pedal and a little more fuel gets added to the combustion chamber (you can't just dump lots of fuel due to limits of flammability and stoichiometry), and the compressor turbine starts to spin faster which puts more air into the combustion chamber so you can add more fuel -- this is called the bootstrap process...however, this only helps you go faster when the free power turbine is able to harness this excess energy (technically temperature or enthalpy) and put power out the power shaft into the gear reduction box. By the time all of that stuff happens, you might have had a close encounter with a city bus -- so any acceleration maneuvers in a turbine powered car must be planned well in advance. Also, forget about any engine braking, power goes only one way in a turboshaft. However, if you just want to drive around in a car that sounds like a jet at takeoff...I can't imagine a better way to do it -- because this would cost you easily $50k to build your own if you had the right connections. 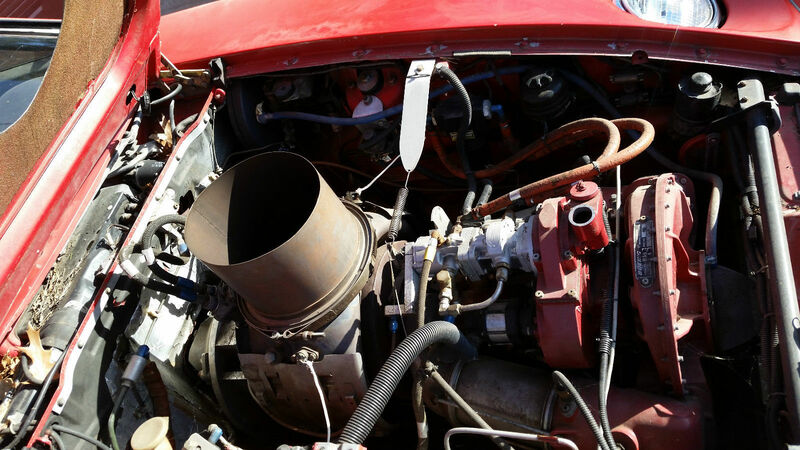 Another thing that might surprise you about turbine engines is the parts cost. You don't simply head down to your local Pep boys to pickup a spark plug for $1.99 -- the basic rule of thumb when it comes to aerospace parts is to add 10x-20x the cost when compared to a consumer good...and forget about something like a full engine teardown without the proper tools and know-how -- do you know how to properly pre-load new foils on an air bearing...cause the guy at the independent Porsche shop won't. However, if you live near a small airport, you might be able to find a small time aircraft mechanic who is willing to help with something that doesn't require FAA certifications. Sounds pretty damn cool, but geez, talk about a niche vehicle. I have zero clue about these kinds of builds, but what about power options (ie, steering?) that run off traditional engine power. How does that work? I wonder how loud it really is! And what the gas mileage would be! Sadly it doesn't look as sporty as a stock 928. The noise and conversation factor are off the charts. You'll need a partner with those airport flashlight wands to park it - deal-breaker for me. At least you don't need an airport tug to back it out of your driveway. Reminds me of the Batmobile sound wise.....will it run on Vodka ? Some one else in the Seattle area has a JET powered 40 Ford also. Um, wow? This thing is fantastic! I discovered cars the year that Parnelli Jones came oh-so-close to winning the Indy 500 in Andy Granatelli's first turbine car, so this crazy Porsche project just tugs at my heart. Absolutely crazy, but cool. Plus, I bet he has no trouble clearing ice from the windshield! I'm pretty sure that the column of gray-black smoke pouring out of the centrifugal turbine might be a bit of an impediment to vision in itself. This is...well, the 502 was very early tech, and not exactly powerful. So...interesting development exercise, but if you want a real car out of it see who'll swap you even for an LS1. Wild, however, 2700 views + zero bids = ?......... . And, being from lower West/NY I have seen this TurbineCRX and is truly not too loud either. 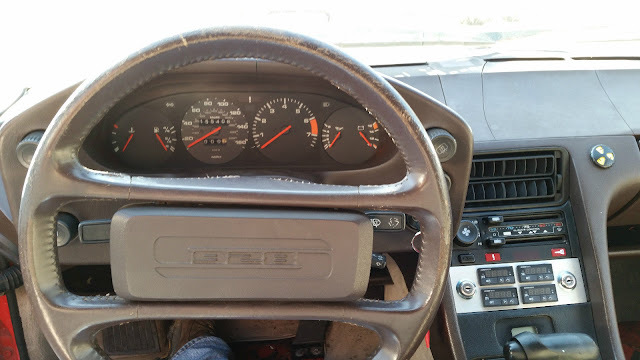 Although it is an impressive feat of engineering to make everything fit and work, it seems like the crazy old man found a way to make the 928 worse. This has got to be a retired aircraft mechanic's toy. All I could think during the video is that his neighbors must HATE him with that noise. There's a reason no one wants to live near an airport. Well some of those subie's or import's with coffee can exhaust are loud also or some of the Cowboys with there straight Diesel exhaust mostly Dodge's come to mind are loud also. Too much noise for the street. Not going to find as many jet car's i do agree with air traffic can be a pain. I can smog this in California, right??? ?